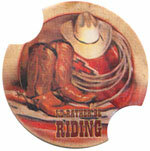 We offer a diverse selection of coasters. Please select the level of product you are interested in, or continue to scroll down to view all of the available coasters. Elegant Home Coaster Sets come with four coasters, all of the same design, with a matching ceramic caddy. 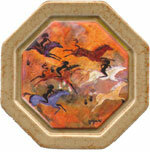 The coasters themselves are made from dyed sandstone, framed in matching ceramic. Our sandstone coaster sets come in packages of four, each with the same design. 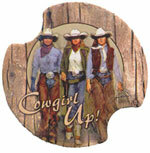 Our coaster assortments come in packages of four coasters, each of a different design so you can mix things up. They're ergonomically designed so they can be picked up easier, and they're made with pride in the good ol' U.S.A.
Carsters let you bring the fine craftsmanship and functionality of Thirstystone along with you in the car. These are coasters designed to fit into the cup holders of most Cars, Trucks, and SUVs. They come in matched sets of two.